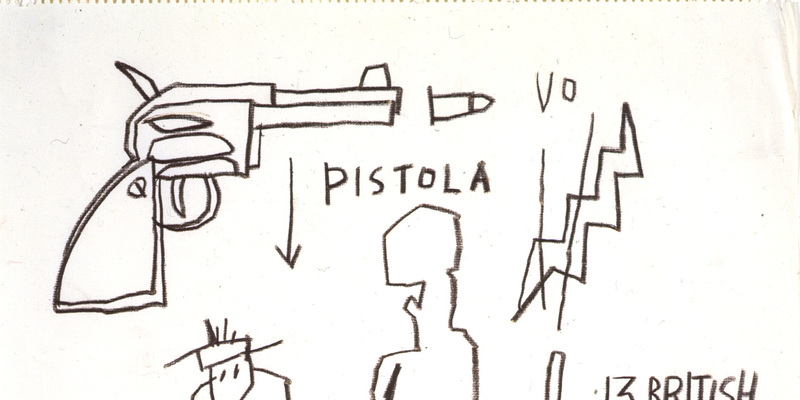 Ubu Gallery presented works of art by a diverse group of modern and contemporary artists, in which the image of the gun was incorporated. The media shown in this exhibition included objects, collages, assemblages, paintings, drawings, prints and photographs. The Gun: Icon of Twentieth Century Art explored the role of this ‘loaded’ icon, whose cultural role and presence has influenced its visual significance. The gun is charged with paradoxical associations: for some it may arouse fear and images of violence, while others may view it as a harbor of safety and source of protection. As an object divorced from its functionality, its advanced design, ergonomic form and heft lend it sculptural and graphic significance. Yet its pervasive presence in action films and pop culture trivializes its potency. Perhaps it is just this ambiguity that has attracted a wide range of artists to incorporate gun imagery into their work. In counter to the “charge’ that Ubu could be seen as glorifying guns through this exhibition, we solicited contributions for the benefit of the Coalition to Stop Gun Violence and New Yorkers Against Gun Violence.